The Ordos Basin is the largest petroliferous basin in China, where the Chang 7 Member shale serves as the major source rock in the basin, with an area of more than 100,000 km2. 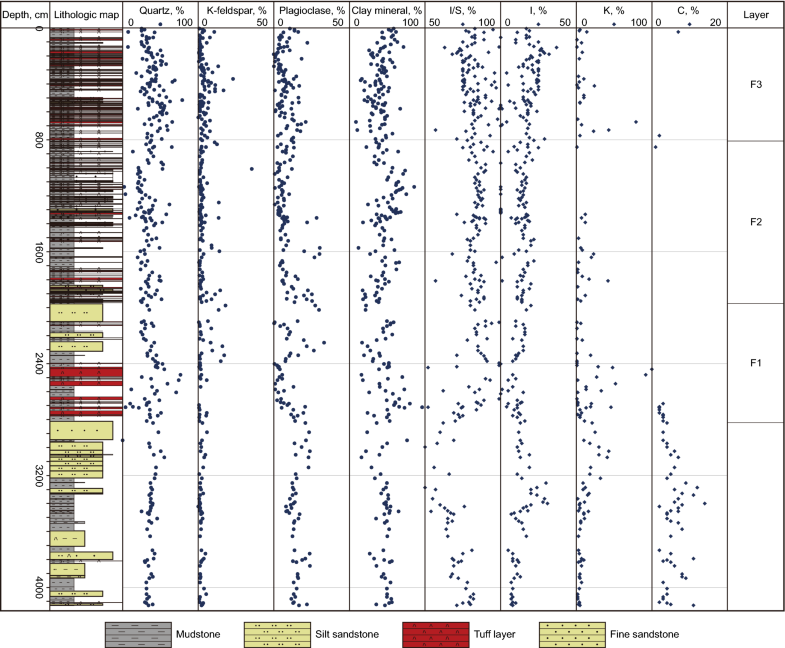 So far, sedimentary and geochemical characterizations have rarely been conducted on the shale in shallow (< 1000 m) areas in the southeastern part of the basin, but such characterizations can help identify the genesis of organic-rich shale and promote the prediction and recovery of shale oil. 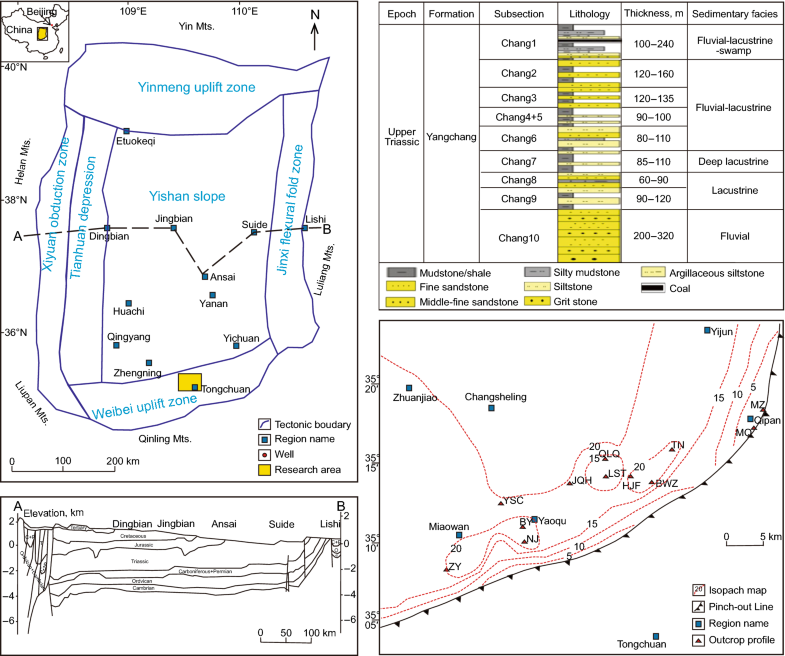 In this paper, several outcrop sections of the Chang 7 Member in the Tongchuan area were observed and sampled, and sedimentary and geochemical characterizations were conducted for the well-outcropped YSC section. The study results show that the Chang 7 Member shale is widely distributed laterally with variable thickness. The organic-rich shale is 7–25 m thick in total and exhibits obvious horizontal variation in mineral composition. In the eastern sections, the shale contains organic matter of Type II2–III and is low in thermal maturity, with high clay mineral content, low K-feldspar content, and no pyrite. In the western sections, the shale contains Type II1 organic matter and is low in thermal maturity, with high clay mineral, K-feldspar, and pyrite contents. The YSC section reveals three obvious intervals in vertical mineral composition and organic abundance. The Chang 7 Member organic-rich shale (TOC > 10%) contains mainly sapropelite and liptinite, with Type II kerogen. It is generally characterized by a hydrocarbon potential of more than 70 mg/g, low maturity, and shallow–semideep lacustrine facies. In the western sections, the shale, still in a low maturity stage, has a higher hydrocarbon potential and is optional for shale oil recovery. However, the Chang 7 Member shale in the study area is highly heterogeneous and its shale oil recovery is practical only in the organic-rich intervals. The Ordos Basin is the largest petroleum production basin in China, where the PetroChina Changqing Oilfield Company has produced more than 50 million tonnes of oil and gas each year for the past four consecutive years. The Mesozoic Triassic Chang 7 Member shale serves as the major source rock in the basin (Zhang and Li 2001; Yang et al. 2016). It is distributed extensively and has a high expulsion efficiency and supplies oil for a number of tight play zones (e.g., Chang 4 + 5, Chang 6, Chang 8, and Chang 9). The recently estimated oil resources exceed 12.8 billion tonnes (Zhang et al. 2006; Deng et al. 2009). Driven by the shale gas revolution in North America, the Chang 7 Member organic-rich shale is coming into the spotlight for exploration for, and research into, tight and shale oils (Miller et al. 2008; Jarvie 2012; Clarkson et al. 2012; Donovan et al. 2012; Yang et al. 2013; Zou et al. 2013; Zhang et al. 2015). Currently, the Chang 7 Member unconventional oil is mainly recovered by horizontal well volume fracturing techniques. The Xin’anbian oilfield, the first large tight oil reservoir in China, was discovered in the central part of the basin. Previous studies of Chang 7 Member unconventional petroleum often focused on the genesis and structure of lacustrine gravity flow sandstone, the formation mechanism of the organic-rich shale, subtle reservoir evaluation, accumulation mechanisms of oil, evaluation of mobile oil, and identification of sweet spots (Zou et al. 2010; Zhang et al. 2009, 2010; Cui et al. 2016; Yang et al. 2015). In a State Key Program for Basic Research of China (937 Program) project, we reviewed the literature on unconventional petroleum geology in China and abroad, and found that fine-grained sediments were deemed as a key object (Schieber et al. 2007; Zou et al. 2013; Lazar et al. 2015). Unfortunately, there are only few continuous shale cores and little data on meter-scale macroscopic variations. Outcrops are the most practical choice for studying fine-grained sediments. For the southeastern Ordos Basin, especially the Tongchuan area, a lot of studies have been conducted on shale with respect to sedimentary environment, genesis, distribution, characteristics, and resources (Lu et al. 2006; Zhang et al. 2006; Li et al. 2009; Ren 2008), but no detailed sedimentary and geochemical characterizations have been made of outcrops. The horizontal and vertical sedimentary and geochemical characterizations of organic-rich shale in Chang 7 Member are insufficiently detailed. 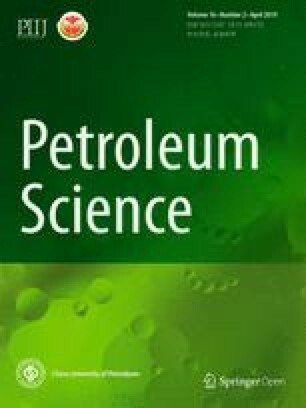 This has made it difficult to get a better understanding on the formation mechanisms and sedimentary patterns of fine-grained sediments and to select intervals for shale oil production. Even worse, the decline of global oil prices and limited knowledge of shale geology have forced many shale oil production plants to shut down. In this paper, several outcrop sections of Chang 7 Member in the Tongchuan area were observed and sampled. Based on available logs and drilling data, the sedimentary and geochemical characterizations were conducted for the well-outcropped YSC section to describe the longitudinal variation of organic-rich shale. Finally, the sedimentary pattern of the Chang 7 Member shale was established. The Ordos Basin is a typical superimposed basin in central China. It was in a marine environment before the Early Permian. Along with the water regression toward the east, south, and west after the Early Permian, it evolved into a marine–continental cratonic basin in the Paleozoic and then into a continental lacustrine basin in the Mesozoic. In the basin, there are three petroliferous systems (from bottom to top): the Lower Paleozoic Ordovician marine gas-bearing assemblage, the Upper Paleozoic Carboniferous–Permian transitional gas-bearing assemblage, and the Mesozoic Triassic continental oil-bearing assemblage. The basin, as a whole, has a large west-trending gentle slope with a gradient of about 1° (Fig. 1a, b). Depending on the basement and fault characteristics, the basin is divided into six second-order tectonic units, including the Weibei Uplift, Yishan (Shanbei) Slope, Tianhuan Depression, Yimeng Uplift, Xiyuan Thrust, and Jinxi Flexural Fold. The Weibei Uplift, trending NS-SW, is located in the southeastern part of the basin. Bordered by the Weihe Graben and Yuxi Uplift to the south, the Weibei Uplift is higher in the south than in the north and connects with the southern margin of the Jinxi Flexural Fold to the east to form a cascade fold at the southeastern margin of the basin. In the southeastern Ordos Basin, the Quaternary overburden is dominant. Outcrops are found in the Triassic Yanchang Formation in valleys and hillsides, which lies disconformably with the Zhifang Formation with varying denudation at the top and in parallel unconformity with the Jurassic Yan’an or Fuxian Formation at the bottom. Overall, the Yanchang Formation developed in a period when the lacustrine basin was quite large. This formation contains ten oil formation (Chang 1–10) members from top to bottom (Fig. 1c). The Chang 7 Member represents the period that the lacustrine basin suffered the maximum flooding, when a semideep–deep lacustrine sedimentary system was deposited in the southern part of the Ordos Basin (Yang et al. 2010). A black shale sequence at the bottom of Chang 7 Member, also known as “Zhangjiatan shale,” is a regional marker bed. In the previous studies, the oil shale in the Yanchang Formation was believed to be controlled by sedimentary facies. In the Wuqing-Qingyang area at the center of the lacustrine basin, the deep lacustrine oil shale is generally 20–30 m thick, and even up to 40 m. In the northern Shaanxi area, the shallow lacustrine oil shale in the eastern part is generally less than 10 m thick, and the semideep–deep lacustrine oil shale in the southeastern part is generally 10–20 m thick. The Chang 7 Member oil shale in this part of the basin is characterized by wide distribution, miscellaneous occurrences, rich foliation, high asphaltene content, high resource potential, and high geochemical grade. The Chang 7 Member oil shale outcrops in the Yijunnan-Tongchuan-Xunyi area in the southern part of the basin. Typical outcrop sections include the Zaoyuan (ZY), Niejiahe (NJ), Beiyingou (BY), Yishicun (YSC), Jiaquhe (JQH), Qianlieqiao (QLQ), Liushutai (LST), Hejiafang (HJF), Bawangzhuang (BWZ), Tangnihe (TN), Maquan (MQ), and Mazhuangcun (MZ), as shown in Fig. 1d. 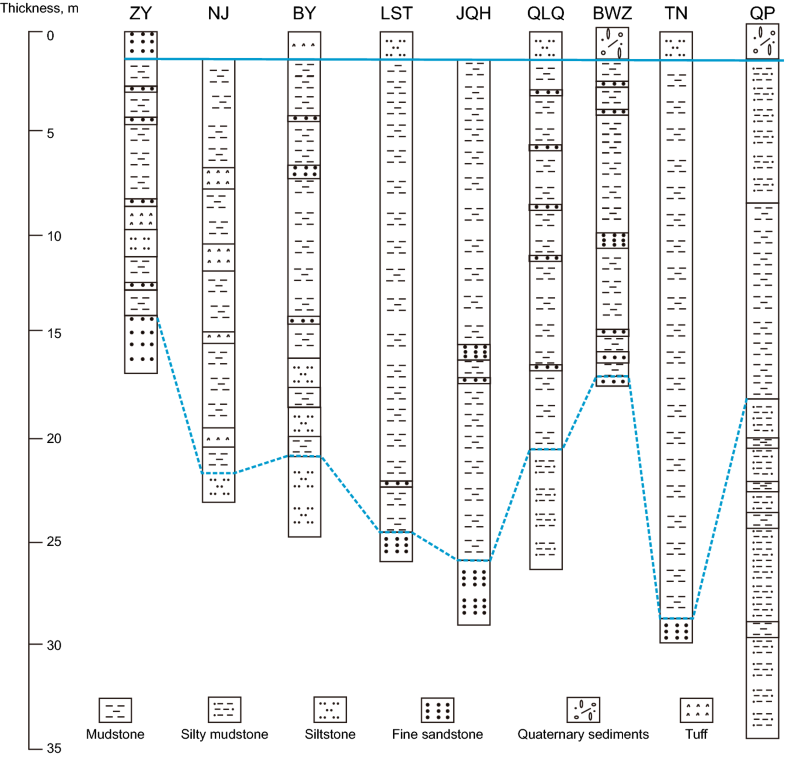 Samples were taken from eight outcrop sections, i.e., ZY, NJ, BY, YSC, BWZ, TN, MQ, and MZ, as shown in Fig. 1d. The shale samples were analyzed for properties and minerals. The geochemical characteristics of 294 samples over a thickness of 40 m in the YSC section were obtained. Total organic carbon (TOC) and total sulfur (TS) were determined with a Leco CS230 carbon–sulfur detector according to GB/T 19145-2003. First, about 10 mg of powdered sample was weighed on an electronic balance and then placed into a porous porcelain crucible that had been heated in a 1000 °C Digital Muffle Furnace for 2 h. Second, a sufficient volume of 12.5% HCl was added to the crucible and heated on a hot plate for 2 h until it was fully reacted with sample. Third, the sample was washed with distilled water in crucible once every 30 min for 3 days. Finally, crucible and sample were dried in a 60 °C oven, and cooled before TOC and TS analysis. Rock–Eval pyrolysis was conducted at the Key Laboratory of Petroleum Geochemistry, CNPC, following the procedure recommended in GB/T 18602-2012. In the experiment, 30–50 mg of powdered sample was weighed on an electronic balance and put into the Rock–Eval 6 crucible for pyrolysis. The measurement parameters included free hydrocarbon (S1 mg HC/g rock), hydrocarbon potential (S2 mg HC/g rock), maturity, and maximum pyrolysis temperature (Tmax, °C). Source rock parameters included hydrogen index (HI), oxygen index (OI), and productivity index (PI). Whole-rock mineral and clay mineral compositions of the shales were analyzed by using a Rigaku TTR X-ray diffractometer under the conditions recommended in SY/T 5163-2010. During the whole-rock mineral composition analysis, 300-mesh powdered samples were selected to calculate the mass ratios of the minerals using the analysis software and the K value given in the international standard. The clay mineral composition was obtained by five steps. First, the samples were suspended to extract clay minerals. Second, the clay extracts were naturally dried at normal temperature and tested. Third, the sections were saturated with ethylene glycol at 60 °C for 8 h and tested again. Fourth, the sections were taken out of the diffractometer and heated at 550 °C for 2.5 h. Finally, the contents of clay minerals were calculated by using analysis software. The Tongchuan area is located in the Weibei Uplift and is a NW-dipping landform. The geological map of Binxian county (I4907, 1: 200000) shows that the oil shale intervals to the south of the oil shale outcrop line are denuded and the area to the northwest contains oil shale. According to the measurement of dip angles, among the eight outcrop sections, the ZY, BY, YSC, NJ, and MQ sections have a fairly flat or even horizontal attitude; the BWZ section shows a NNW inclination of 8°–10° and the MQ section shows a NNW inclination of 5°–8°; the TN section, near a fault belt, is much steeper,, with an NNE inclination of more than 40°, and up to 70° in oil shale intervals. Previous studies detected some liberal small-sized folds and minor fault structures locally in the southeastern part of the Ordos Basin, where the burial depth of oil shale generally increases from the southeast to the northwest; however, constrained by local landforms, the maximum valley-hillside height difference can be more than 200 m (Ren 2008; Li et al. 2014). Field observations of eight sections suggest that the shale layers are highly heterogeneous and exhibit three sedimentary phenomena: (a) the presence of thin-layered tuffs in shale intervals (Fig. 2c, e, l, k); (b) the presence of lenses or nodules (Fig. 2, d, j); and (c) the presence of sand (Fig. 2f, g, m, p). The whole-rock mineral composition analysis reveals that the samples from eight outcrop sections differ greatly in mineral composition (Fig. 3). In the western sections (TN, NJ, BY, ZY, and BWZ), the shale samples contain quartz (22%–37%), K-feldspar (> 4%), clay minerals (28%–45%), and pyrite (> 4%). In the eastern sections (MZ, and MQ), the shale samples contain quartz (26%–37%), K-feldspar (< 4%), and clay minerals (52%–60%). Clearly, the shale samples from the western sections have lower clay content and higher pyrite and K-feldspar contents than those from the eastern sections. Such differences in mineral composition may imply different sedimentary provenances and environments. Jarosite, a weathering product of pyrite, is a weathering indicator, and its relative content can be used to evaluate the magnitude of weathering. All the samples, except those from J6 and BY2, have a jarosite content of less than 5%. Fresh samples used in this study were collected by digging trenches to minimize potential influence of weathering on outcrop samples. 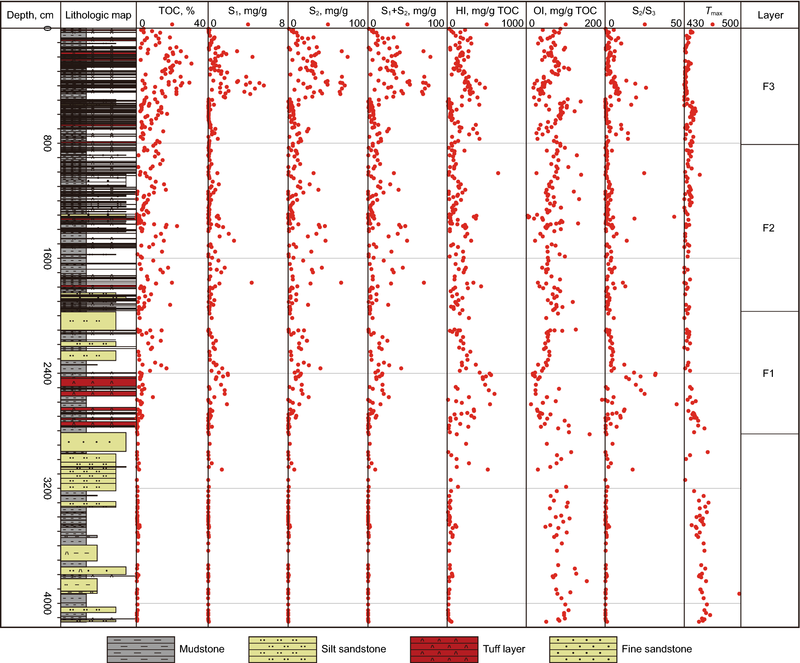 The geochemical characterization shows that shale samples are very different in geochemical parameters. The samples from the western sections (TN, NJ, BY, ZY, and BWZ) have TOC of more than 10% and TS of higher than 2.7%, whereas the samples from the eastern sections (MZ and MQ) have TOC of less than 5% generally or up to 7.2% individually and TS of less than 0.1%, as shown in Fig. 4a. Ren (2008) suggested TS of 3% or higher after evaluating minerals of oil shale from the western sections of Tongchuan, confirming reliability of our test result. The Rock–Eval pyrolysis indicates that the samples from the western sections have a higher hydrocarbon potential (S1 + S2) of more than 80 mg/g and an average S1 of 4.15 mg/g, whereas the samples from the eastern sections have a lower hydrocarbon potential (S1 + S2) of less than 15 mg/g and an average free hydrocarbon content of 0.09 mg/g, as shown in Fig. 4b. According to HI-OI and HI-Tmax, the shale samples from the western sections contain Type II1 organic matter, while the shale samples from the eastern sections contain Type II2–III organic matter, as shown in Fig. 5. The vitrinite reflectance (Ro) is 0.6%–0.8% for the samples from the western sections (TN, NJ, BY, and ZY) and 0.5%–0.6% for the samples from the eastern sections (MZ, and MQ), whereas the Ro of the samples from BWZ is close to that of the samples from the eastern sections, as shown in Fig. 6. 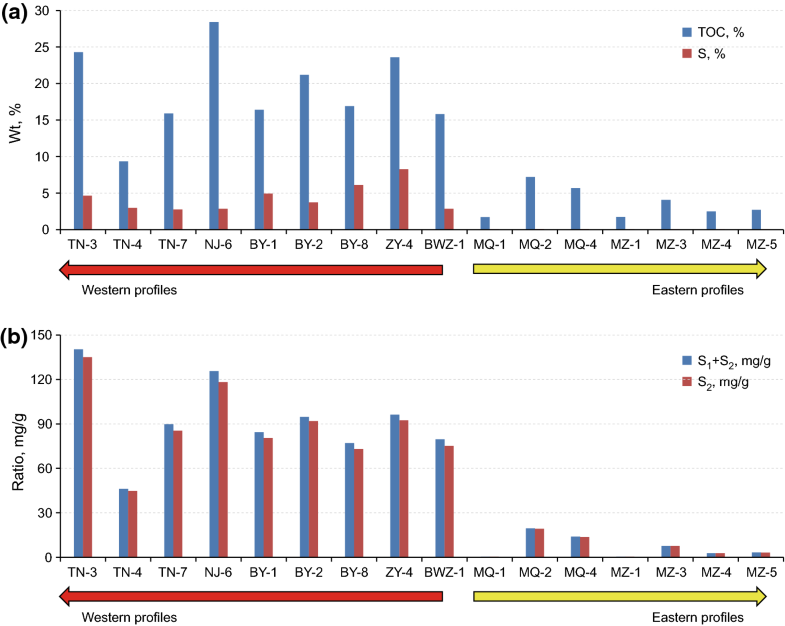 Generally, the samples from the eastern sections have lower TOC, inferior organic matter, and lower maturity than those from the western sections. It can be seen that the shale in the eastern sections is essentially immature, implying no shale oil is available for production. Although previous studies have shown that shale in the Tongchuan area thickens from west to east and from south to north, based on the horizontal outcrop variation of oil shale locally, the great thickness does not correspond to better source rock quality. Li et al. (2014) graded the oil shale in the Tongchuan area by oil content using ΔlogR method (which is used to identify and calculate the organic carbon with logging data), together with the drilling data. 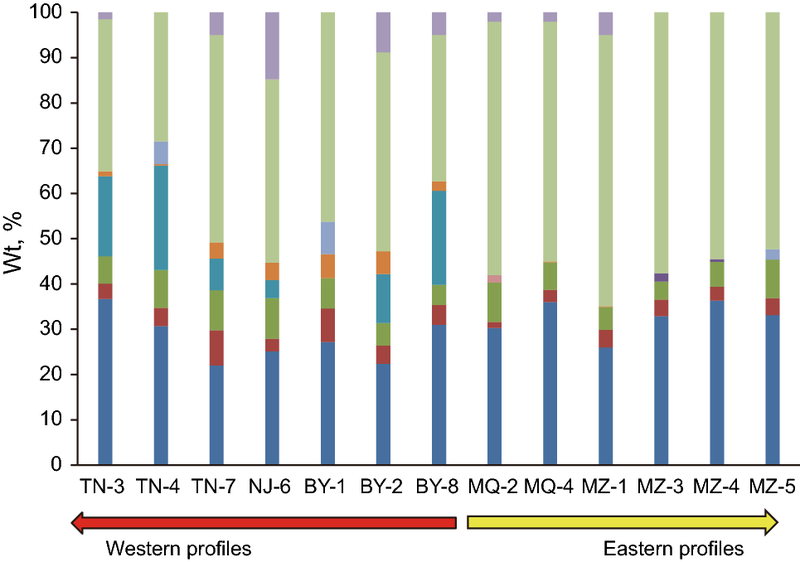 This study proposes that the eastern sections represent low-quality resource areas, while the western sections represent medium-quality resource areas. The shale intervals observed from the outcrop sections show strong heterogeneity. Typically, the samples from the YSC section (Fig. 1) were selected for analyzing the vertical sedimentary and geochemical characteristics of shale. As the Chang 7 Member high-quality source rocks are rich in thin-layered tuffs, 156 layers of tuffs were sampled from the YSC section at a centimeter-scale. Zhang et al. (2009) identified more than 180 layers of tuffs at millimeter- to centimeter-scale in the Chang 7 Member source rocks from Well Zheng-8 in the southern part of the Ordos Basin and concluded after observation and calculation that the tuffs gradually thin from the southwest to the northeast (with a thickness of more than 1.0 m in the Zhengning-Huangling area) and the tuffs are either airborne or waterborne (Deng et al. 2008; Zhang et al. 2009). Most scholars believed that the volcanic crater was derived from the Qingling orogeny (Deng et al. 2008; Wang et al. 2014). The mineral composition analysis shows that there are two types of lithologies across the YSC section: the Chang 8 Member sandstone in the lower part and the Chang 7 Member shale in the upper part (Fig. 7). The former is prominently marked by the presence of chlorite (C%), and it is a typical product in an alkaline environment (Sruoga et al. 2004; Huang et al. 2009). The latter can be subdivided into three sub-members, i.e., F1, F2, and F3, from bottom to top (Fig. 7). F1 has high quartz, clay mineral, but low plagioclase content. F2 has low quartz content, alternating low–high–low clay mineral, and slightly high K-feldspar content. F3 has alternating low–high–low quartz, K-feldspar, and kaolinite contents. Obviously, the whole-rock mineral and clay mineral compositions are affected by deposition and diagenesis (Sonnenberg et al. 2011; Sruoga et al. 2004; Huang et al. 2009). In this study, the Chang 7 Member shale was investigated for vertical variation of the whole-rock and clay mineral compositions. It is found that the three sub-members (with a total thickness of 28 m) vary in an ascending order of whole-rock and clay mineral compositions vertically. When F1 (8 m) was deposited, the water began to deepen, and the shale was interrupted by thick tuffs (> 2 cm) and contained a quite high content of feldspar, followed by kaolinite; at the end of this deposition period, thick siltstone bodies (gravity flow) were developed. When F2 (13 m) was deposited, the water deepened further and tuffs with different thicknesses were deposited; the shale in this period contained a fairly low and stable content of quartz, and an alternating low–high–low content of feldspar, clay minerals. When F3 (7 m) was deposited, several layers of thin tuffs (< 2 cm) were developed, and the shale contained a relatively high content of quartz and an alternating low–high–low content of clay minerals. The geochemical characterization results reveal that the 294 shale samples from the YSC section reflect three TOC intervals with respect to free hydrocarbon (S1), pyrolysis hydrocarbon (S2), hydrocarbon potential (S1 + S2), hydrogen index (HI), and organic type parameter (S2/S3). The three TOC intervals fully coincide with the three sub-members mentioned above (Fig. 8). In Chang 71, the layer is thin, and TOC is 2.5%–17%; within the high-TOC interval with a thickness of 5 m, Type II1 organic matter is dominant, and the maximum hydrocarbon potential is 26 mg/g; within the remaining part, Type II2–III organic matter is dominant, and the maturity is low. In Chang 72, TOC is 3.0%–18%; within the high-TOC interval with a thickness of 13 m, Type II1–II2 organic matter is dominant, the maximum hydrocarbon potential is 50 mg/g, and the maturity is low. In Chang 73, TOC is 2.5%–30%; within the high-TOC interval with a thickness of 5 m, Type II1–II2 organic matter is dominant, the maximum hydrocarbon potential is 70 mg/g, and the maturity is low; within the remaining part, Type II1–III organic matter is dominant. Coincidentally, the study of oil shale in the Binxian area in the south of the Ordos Basin also suggests three sub-member deposits: A1, A2, and A3. Since oil shales in both the southern and southeastern parts of the basin have experienced three development episodes, it can be inferred directly that there should have also been three mineralization episodes in the southern part of the basin. Based on the geochemical characterization results, together with the shale thickness, hydrocarbon potential, and organic matter type, we suggest that the most favorable shale oil target should be the uppermost Chang 73, different from the medium-thick areas determined by Ren. The recovery priority should therefore be F3 > F2 > F1. Overall, the shale in the Tongchuan area is not comparable to that in the USA in view of distribution, thickness, organic matter type, or hydrocarbon potential (Smith 1960; Cashion 1967). As previously estimated, the Tongchuan area has shale oil reserves of 953 million tonnes, technically recoverable shale oil resources of 357 million tons, shale oil resources of 58.8 million tonnes, shale oil in-place of 23.2 million tonnes, and recoverable shale oil resources of 16.6 million tonnes (Li et al. 2014; Ren 2008). It is concluded that selecting the highest-quality horizon through heterogeneity study is critical for shale oil recovery. The sedimentary environment and pattern of the Chang 7 Member shale in the southeastern part of the Ordos Basin is highly controversial. Some scholars believe that the shale in the Tongchuan area is semideep–deep lacustrine facies (Bai et al. 2009; Yang et al. 2010), while other scholars argue that it comprises shallow lacustrine facies (Bai et al. 2010; Ren 2008). The terms “(shore-) shallow lacustrine facies” and “semideep–deep lacustrine facies” are often confusing, because a lacustrine shore is hardly distinguishable from a shallow lacustrine and a semideep lacustrine is hardly distinguishable from a deep lacustrine. Shallow lacustrine facies can be distinguished from deep lacustrine facies easily; the shoreline is a very important divider, but the shoreline itself is not always easy to define as it is highly variable (Bai et al. 2010). In practice, geologists usually divide oil shale into three types of sedimentary facies, i.e., marine, lacustrine, and marine-continental, and assume marine oil shale to be mainly present in a deep lacustrine environment. Some scholars suggest that this misunderstanding might have been caused by the inclusion of mudstone as oil shale. Bai et al. (2010) investigated wells with typically different sedimentary facies in the Ordos Basin and concluded that the shallow lacustrine facies corresponded to a limited number of oil shale layers, with small single-layer thickness (0.5–2.0 m) and small total thickness, shallow–semideep lacustrine facies corresponded to more oil shale layers, with large single-layer thickness (2–11 m) and large total thickness, and deep lacustrine facies corresponded to multiple oil shale layers, with small single-layer thickness (0.5–2.0 m) and large total thickness. 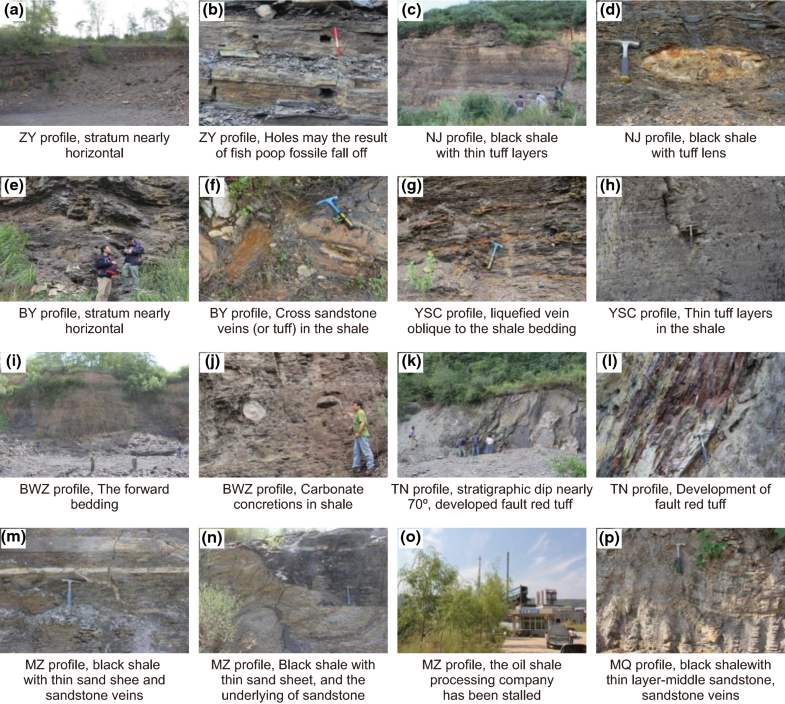 In this study, the development period and the sedimentary environment and pattern of the Chang 7 Member shale were determined based on the lithology, geochemical characterization results and oil shale formation environment. According to the lithology of the study area, the eastern sections have fairly thick fine-grained sediments, most of which are silty mudstone. The 7-m-thick mudstone interval is quite low in TOC and has Type III kerogen but no coal. Thus, the eastern sections are considered to contain shore/shallow lacustrine sediments. In contrast, the western sections present significant variation in mudstone thickness, with the concentrated thickness observed in TN, LST, and near BY. In addition to the thick mudstone, the western sections also contain tuff interlayers and fine sandstone (Figs. 2, 9). Depending on the regional position and the oil shale thickness map, it is believed that the western sections could be shallow/semideep lacustrine facies rather than deep lacustrine facies. Moreover, the geochemical analysis results also confirm that the shale in the Tongchuan area contains Type II–III organic matter, either vertically or horizontally. For both the eastern and western sections, Type III is dominant, but only three shale intervals in the western sections have Type II (Figs. 5, 8). Since the deep lacustrine facies often corresponds to organic-rich shale with high TOC and Type I kerogen, the deltaic semideep lacustrine facies corresponds to mudstone with low TOC and Type II kerogen, and the fluvial and deltaic plain facies corresponds to carbonaceous mudstone with high TOC and Type II–III kerogen, the Chang 2 Member shale in the study area is believed to have been deposited in shallow lacustrine facies, except for the three high-TOC intervals that were deposited in semideep lacustrine facies. 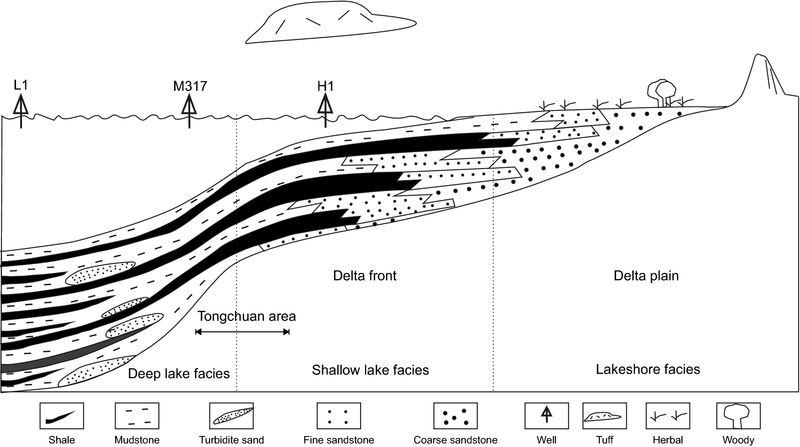 Paleo-climate and paleo-environmental studies indicate that the Chang 7 Member shale in the Tongchuan area was deposited in a platform shallow lacustrine sedimentary environment, where intense regional tectonic movements (150 layers of tuff) caused three episodes of water deepening in the study area, resulting in a semideep lake environment. Filling of volcanic materials, water deepening, and the consequent changes in the oxidation and reduction environment contributed to a good sedimentary environment (Zimmerle 1985; Frogner et al. 2001). In the Triassic, the climate in the Tongchuan area was warm and humid. Terrestrial plants grew luxuriantly and aquatic organisms were present. These organisms were degraded and preserved under the formation temperature and pressure conditions along with tectonic movements, thus creating an anaerobic environment to allow for the accumulation and deposition of shale-generating original organic matter (Fig. 6). In brief, the paleo-climate constrained the sources of organic matter, the paleo-lake water bodies controlled the deposition and storage conditions of organic matter, the sedimentary facies dominated the type and thickness of the oil shale deposits, and the paleo-structures determined the organic enrichment through volcanic and turbidity current events and controlled the elevation and exposure of oil shale in the study area. Combining the tectonic setting, organic matter type, climate, and sedimentary characteristics, we established the sedimentary pattern of the Chang 7 Member shale in the southeastern Ordos Basin, as shown in Fig. 10. In this study, eight outcrop sections in the Tongchuan area were observed and sampled to investigate the Chang 7 Member, and sedimentary and geochemical characterizations were conducted for the well-outcropped YSC section. The study results show that the Chang 7 Member shale is widely distributed laterally with variable thickness. The organic-rich interval is 7–25 m thick in total and exhibits obvious horizontal variation in mineral composition. In the eastern sections, the shale contains organic matter of Type II2–III and is low in thermal maturity, with high clay mineral content, low K-feldspar content, and no pyrite. In the western sections, the shale contains Type II1 organic matter and is low in thermal maturity, with high clay mineral, K-feldspar, and pyrite contents. Apparently, the immature shale in the eastern sections implies no shale oil is available for recovery. In contrast, the shale in the western sections has high hydrocarbon potential and is thus a potential for shale oil recovery. We collected samples from 156 layers of tuffs from the YSC section at a centimeter-scale. The results of mineral composition and geochemical study suggest that the shale presents three obvious intervals in mineral composition and organic abundance vertically. Based on the TOC and hydrocarbon potential evaluation, we conclude that the recovery priority should be F3 > F2 > F1. Given the high heterogeneity of the oil shale in the Tongchuan area, selecting the highest-quality horizon through heterogeneity study is critical for shale oil recovery. Depending on the regional position and the oil shale thickness map, it is believed that the western sections should be shallow/semideep lacustrine facies rather than deep lacustrine facies. The shale intervals in the eastern and western sections are generally shallow lacustrine facies, but only three shale intervals in the western sections reflect semideep lacustrine facies. It is concluded that the paleo-climate constrained the sources of organic matter, the paleo-lake water bodies controlled the deposition and storage conditions of organic matter, the sedimentary facies determined the type and thickness of the oil shale deposits, and the paleo-structures dominated the organic enrichment through volcanic and turbidity current events and controlled the elevation and exposure of oil shale in the study area. This study was supported by the National Basic Research Program of China (973 Program, No. 2014CB239001). We are deeply grateful for Li C.C. of Geological Survey Center, Shanxi Province, for his help in the field survey and outcrop. Cashion WB. Geology and fuel resources of the Green River Formation, Southeastern Uinta Basin, Utah and Colorado. US, Geological Survey professional paper 548, 1967. https://doi.org/10.3133/pp548. Jarvie DM (2012) Shale resource systems for oil and gas: part 2—shale-oil resource systems. In: Breyer JA, editor. Shale reservoir-Giant resources for the 21st century. AAPG Memoir 97; 2012. p. 89–119. https://doi.org/10.1306/13321447m973489. Miller BA, Paneitz JM, Yakeley S, Evans KA. Unlocking tight oil: Selective multistage fracturing in the Bakken Shale. In: SPE annual technical conference and exhibition. 2008. https://doi.org/10.2118/116105-ms.